I have four hours to kill on the train to Bristol. 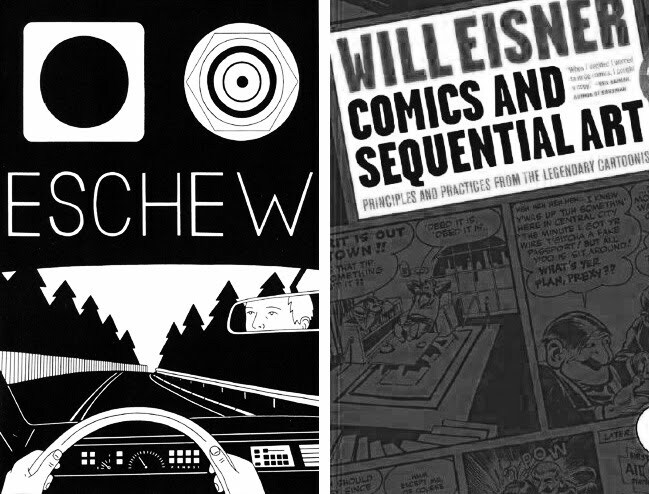 In my bag I have a copy of Will Eisner's Comics and Sequential Art and the second issue of Robert Sergel's ongoing series Eschew. I re-read Sergel’s comic for the third time in two days and begin to compose my thoughts in scribbled bursts on an A4 notepad. The British countryside hurtles by largely unnoticed, muted and distant, framed by a thick pane of glass that sits between me and the outside world. Doncaster, Sheffield and Derby stations come and go, but I'm far too engrossed in Eisner's instructional book to track our steady progress South. I've always been fascinated by the mechanics of comics, particularly their ability to convey information in ways that other mediums cannot. Their fusion of text and image gives rise to a whole host of creative possibilities that simply don't exist anywhere else. To my mind, much of what makes comics so unique boils down to their use of time, or to be more precise, their division of time on the page. Charting the passage of time is something that Eisner explains with great eloquence, using simple yet effective examples to illustrate how an artist's approach can profoundly affect the way a story is perceived. 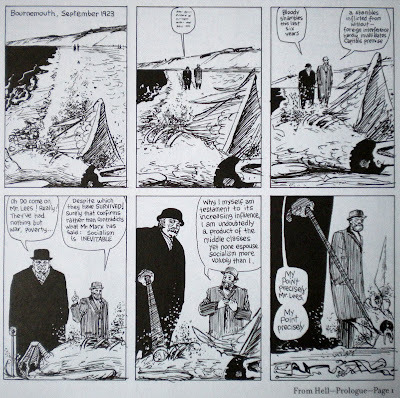 In comics, Eisner explains, six panels could be used to depict a two minute action scene, but equally, those very same panels could be used to chronicle the passing of an entire era. By changing key visual cues, an author can quite literally expand or contract time at will. 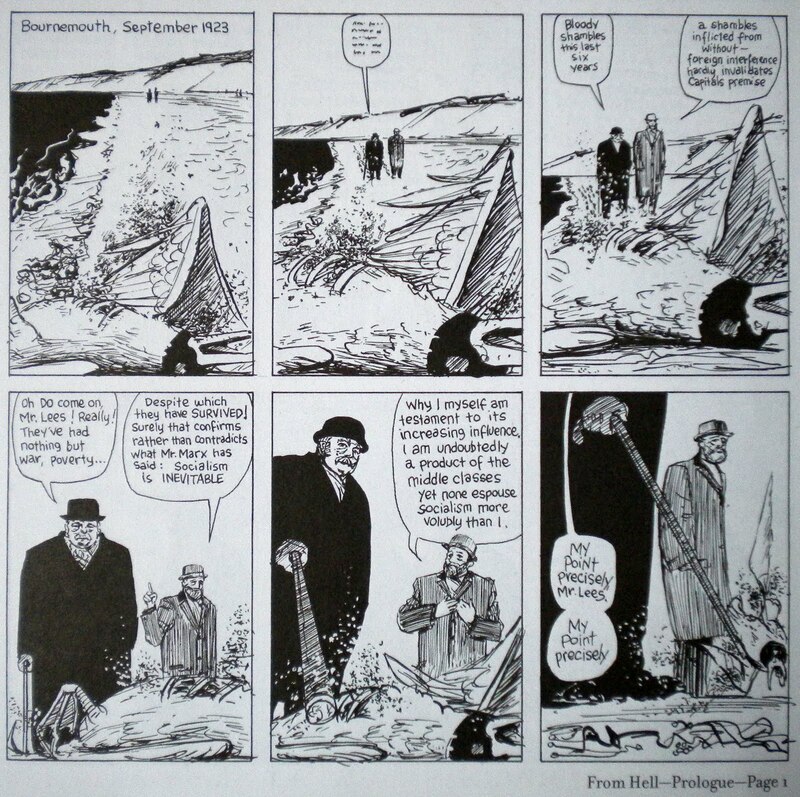 Something as simple as charting the progress of two figures walking down the seafront, as in Alan Moore and Eddie Campbell’s From Hell, does a splendid job of illustrating the passage of time over the course of six panels. As a reader of comics, it’s easy to take these techniques for granted, but for a creator of comics, Eisner’s lessons represent the most fundamental of tools available to an artist. 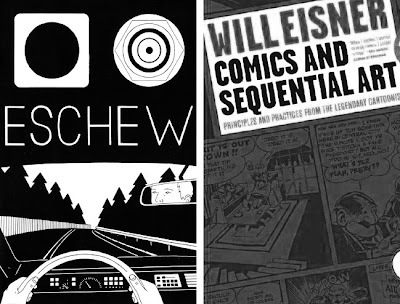 Setting Eisner’s book aside for a moment, I attempt to enunciate what it is that grabs me about Sergel’s work. The words "bold and distinctive" appear on my notepad, but they don't really begin to sum up his elegant line art or refined use of pacing. I spend a good ten minutes flicking through the comic again, mentally dissecting its contents, turning over Eisner’s myriad examples in my mind. 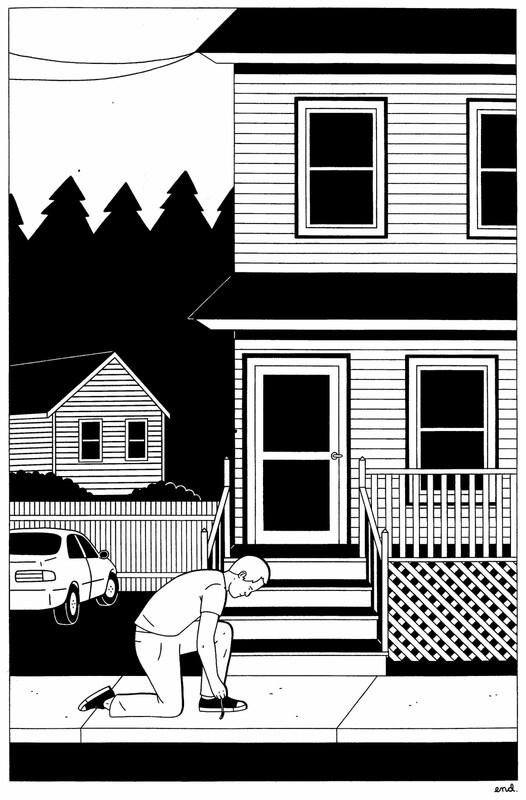 I keep coming back to Sergel’s panel arrangements, those carefully crafted static images that meter out his stories with the precision of a metronome. The beauty of Sergel's work lies in its careful use of layout and timing; in its formalisation of the everyday, transforming the mundane into a series of taught parallel lines and carefully crafted geometric forms. 'Disgusting Human Being', for example, is a 'tell it like it is' one pager that sees Sergel picking the scum from between his toes, going about his daily business, then later realising that his hands are utterly filthy. Likewise, 'My famous grey sweatshirt' chronicles the author's long standing love affair with a particular sweatshirt, drawing on the common experience of that one precious item of clothing that you get a little too attached to. Most amusing of all is Sergel’s subsequent search for a replacement, whereby his cartoon self is subjected to the horrors of his local American Apparel. It's funny, keenly observed stuff, but as good as these shorter pieces are, it’s the closing chapter of Eschew which makes a lasting impression. 'Up Up Down Down' deals with a vivid, introspective flashback to what I presume to be Sergel's youth. 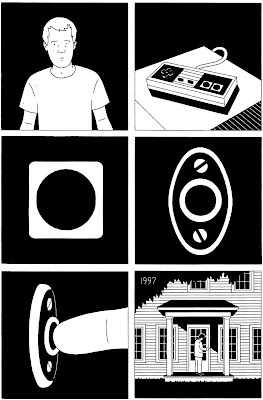 The comic cycles through a series of visual triggers, focusing on recurring circular motifs, as if methodically unearthing memories panel by panel. This seemingly abstract exercise in pattern recognition comes full circle when Sergel discovers his old Nintendo sitting in a cardboard box. Our attention is drawn to the A/B buttons of the joypad, which in turn become the doorbell to Sergel's old family home. Acting as a metaphorical anchor to the past, the discarded games console gives us a fleeting glimpse of a tragic accident that results in the death of a friend. In an effort to reconcile the memories triggered by the discovery of the Nintendo, Sergel hooks it up for a game. When he turns the machine on, the intro screen to Super Mario flickers to life but quickly degenerates into a mess of distorted pixels and glitches. The television becomes a torrid reminder of the lingering guilt caught up with the console. Plaintively Sergel packs away the Nintendo and throws it out, ending the comic with a pensive full page splash. Eschew concludes with an air of sadness and regret, and I'm once again drawn to Sergel’s careful delineation of time; his ability to alter the pace of events with little more than the careful division of a page. When 'Up Up Down Down' concludes, it's as if time has slowed to a crawl. As the world of fiction slowly recedes, the reader is left to consider all that's just transpired. 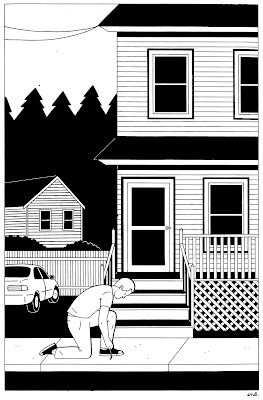 Sergel, like Eisner before him, understands the importance of pacing. Moreover, he fully grasps the impact that a shift in tempo can have upon a story. ‘Up Up Down Down’ hits as hard as it does because it unfolds slowly using a series of elongated panels. In contrast to everything else in Eschew, it feels distinctly open and contemplative, much of which is down to Sergel’s carefully devised page layouts. It’s always a pleasure to see comics executed with this level of care and attention, and with Eschew Sergel has provided us with yet another fine example of their ability to communicate deep and meaningful experiences. I am gonna have to pick this book up-- great review!